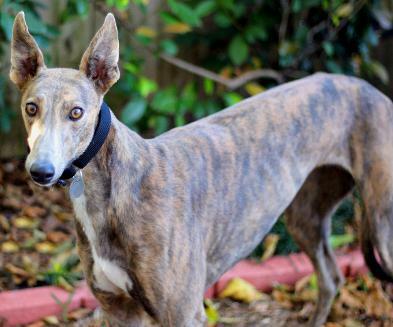 History: Layla is another Greyhound that decided early that she did not want to race with her siblings, which are still in training. We understand that she was born in Iowa and sent to Texas with her litter to train. 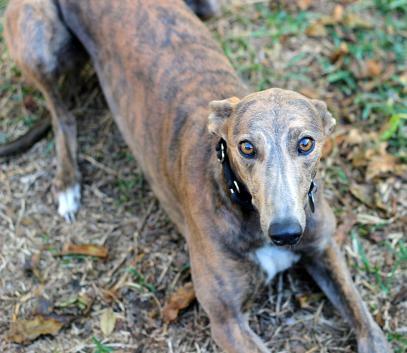 The litter is not registered with the NGA at this time so she is not on Greyhound Data. However, we were told that her dam is Anxious Anna and her sire is Little Andy. We will continue to research her tattoos to see if we can learn more about her. What we do know is that she is an adorable girl with an unusual color. 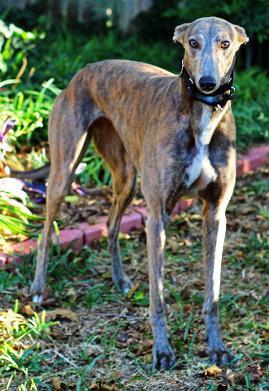 It looks like a smoky haze covers her brindle coat. She has a very expressive face with amber eyes and the cutest big ears. She is a petite girl with a beautiful coat. It is difficult to know much about her personality yet. She is a little unsure of her surroundings (which is understandable) but is lying on the carpet in the middle of the den with other dogs all around her. We are sure she will adjust to home life in no time. February 20, 2015 update: Layla has found her forever home. Congrats to Layla and her new family. 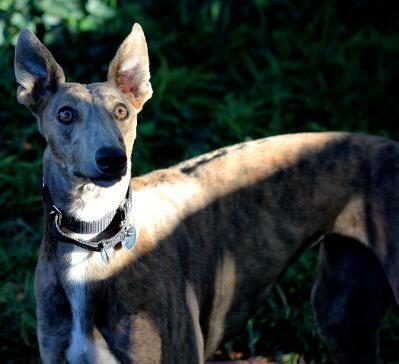 January 18, 2015 update: Layla was returned to TAGS to continue her search for her forever home. 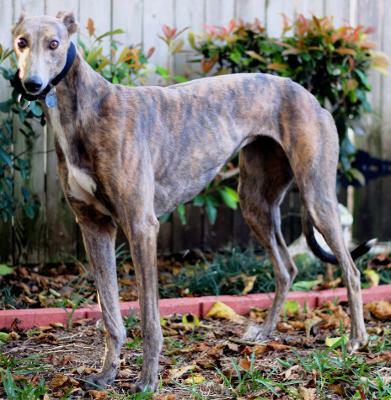 November 30, 2014 update: Layla was adopted by the Watson family and will be living with 3 little dogs. Congratulations to them all!! November 13, 2014 update: Layla was a little shy at first, but quickly adapted and settled in for the evening. Layla seemed, at first, a little nervous about the cats and ran from them. After a few sniffs, she seemed completely at ease with the cats and completely left them alone. The small dogs felt completely comfortable around Layla. She was a happy, easy-going dog around them. 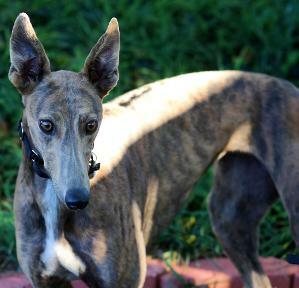 October 28, 2014 update: Layla came to TAGS to find her lifetime home.